Those of you who follow this blog know I work. Because I work, we can’t travel all the time. I hope the long contract I am on doesn’t keep you from reading; we really love it when you read our blog. Anyway, I thought it would be a good idea to let you know what we plan to do when we leave here. Right now my contract ends on July 4, 2016; that is 295 days or 42 weeks or right around nine and a half months from now. But who’s counting! Angela and I have been looking at opportunities of places to go once the contract is over. I ran across an article in one of the RV magazines we read, and told Angela about it. You see, Vermont is one of the remaining five states Angela has never visited according to her rules of travel (see Mounting Our RV Travel Map for the rules). We had hoped to go to one of the Escapee-sponsored venues at some point, and it seems to work with the end of this contract. 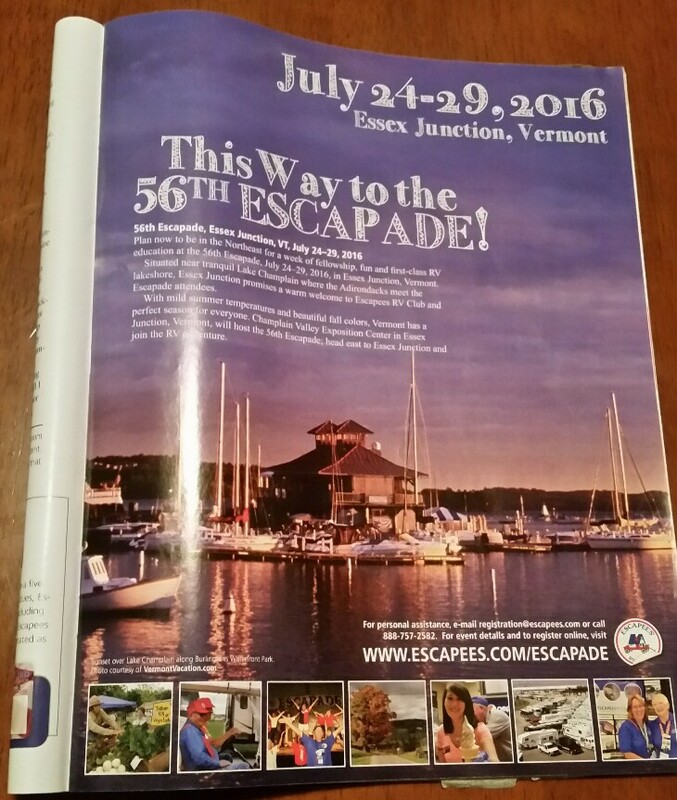 Our plan is to go to the Escapee’s Escapade in Essex Junction, Vermont July 24 – 29, 2016. We have set this more or less in stone for us, so we have been thinking about what-if scenarios and how we will handle them if and when they come up. The biggest “what if” is what happens should I get extended at the Magnolia Client site. The chance of this happening is about 100%. Why? Well, we turn the system on (Go-Live) June 1. I am responsible to ensure the General Ledger is functioning properly, and the first monthly close out with the new system will be the June 2016 close out, which happens in July 2016. My contract ends at the exact time I will be needed to assist with the first close of the new system. So, I do expect to be extended, which means we need a plan. Here is our contingency plan. We are going to move the RV on weekends, and I will fly back to the client from wherever we happen to be. Angela will stay with the RV during the week, and we will move again on the next weekend. Normally, we move 250 miles each day when we are travelling. This is rule of thumb, but after travelling 390 miles in one day last December, 225 to 275 miles is about as far as we care to go in a single day. Where do we expect to end up each day? First, Essex Junction, VT is 1,400 miles from Savannah, TN, so it will take 6 days X 250 miles per day to get there. Here are the communities in which we expect to stay. First day, we make it to Elizabethtown, KY. Day 2, we get to Columbus, OH (where I will fly out and Angela will stay the week). The next weekend, we will make it to Erie, PA and then Buffalo, NY (where I will fly out). The final weekend, we will make it to Kingston, Ontario and finally to Essex Junction, VT. I know it’s a long time away, but we now have something to look forward to and plan. We will keep you informed should anything change. If you want to see the route we plan to take, go to the top of the blog home page and click on “Map.” I have loaded RV sites along the way that may work for our purpose but will change them as we get closer to the date and solidify the trip. I loved my visit to Vermont. I think you will too.